The gold coins pictures above are present on Romanian coins through the kind permission of Mr. Radu Lissner. The coins belong to the Christian Feudal Art Monuments series, 250 sets having been struck. 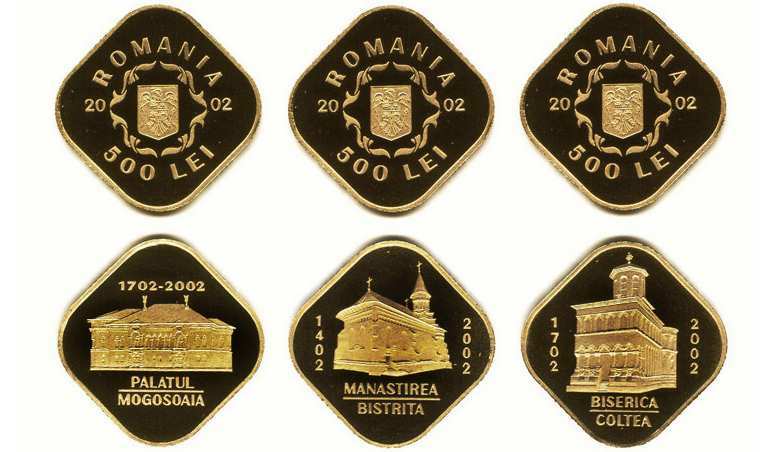 To the same series belong two silver coins of 500 lei issued in 2004 bearing the images of the Three Hierarchs church in Iaşi and of the Cotroceni church in Bucharest, one silver coin of 5 lei issued in 2006 with the wooden church of Ieud-Deal, three silver coins of 10 lei issued in 2008 with the monasteries of Cozia, Voroneţ and Sîmbăta de Sus, three silver coins of 10 lei issued in 2011 with the church of Strei and monasteries of Humor and Hurezi and the 10 lei 2013 silver coin with the wooden church of Rogoz. The monastery of Bistriţa is sited near the municipium of Piatra Neamţ, being raised by ruler Alexander the Good. The founder has endowed the holy place with several villages, apiaries, slaves and the customs income in the borough of Bîrlad. Alexander the Good was buried in the church he founded. Stephen the Great built a belfry at Bistriţa and the chapel consecrated to the Saint John the New of Cetatea Albă. 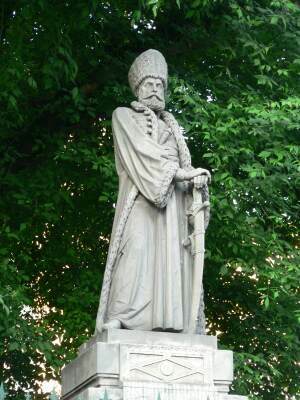 Prince Peter Rareş rebuilt the monastery in 1542, subsequently to the vow he took as fugitive from the face of the Turkish invasion in September 1538, during the short respite the fleeing voivod had at Bistriţa on his way to Transylvania. The church was once more rebuilt in 1554 by prince Alexander Lăpuşneanu. Today the nave of the church is divided into five compartments, partitioning related to the five senses. 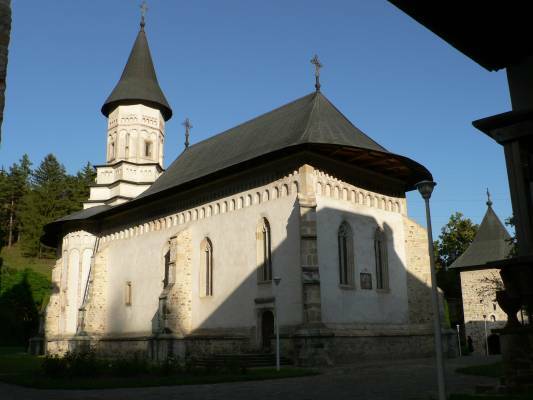 Bistriţa Monastery was one of the most important cultural centers of the Middle Ages Moldavia. The "pomelnic" (a list of dead predecessor rulers and of their relatives used in requiem masses for their repose) of the Bistriţa Monastery, a Slavic manuscript on parchment kept nowadays at the Library of the Romanian Academy, written in the times of Stephen the Great and extended latter until about the year 1700, is a very important document, containing almost all the rulers of Moldavia. In the small monastery museum is kept a bell donated by Stephen the Great. On the bell lies a magnificent personal coat of arms of the great Moldavian ruler. Into the church is kept an icon of Saint Anne with Virgin Mary as child, a representation rarely seen in Romania. 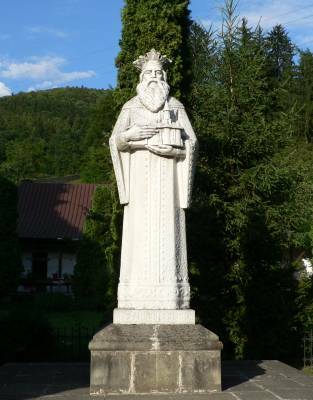 The Bistriţa Monastery from Neamţ county must not be confused with the Bistriţa Monastery from Vîlcea county. The latter was founded at the end of the 15th century BC by the Craioveşti boyars (members of Craiovescu family from Oltenia). 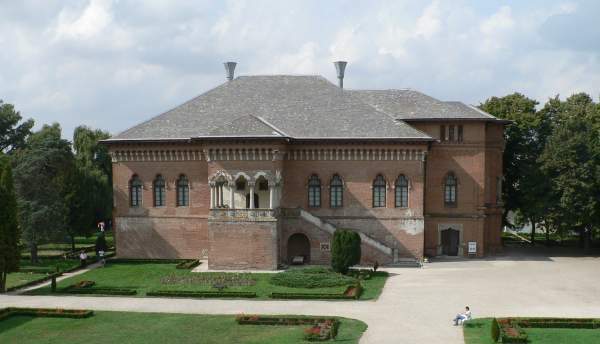 The palace was built on the shores of the Mogoşoaia Lake near Bucharest, and was 1 part of the princely courtyard constructed by the Walachian ruler Constantin Brâncoveanu for his son Stephen. The palace was used as summer residence for the family of the ruler. The constructions have three levels: cellar, ground floor and a story. The architectural style developed in Walachia under Brâncoveanu has influenced the Romanian civil architecture until the 19th century BC. 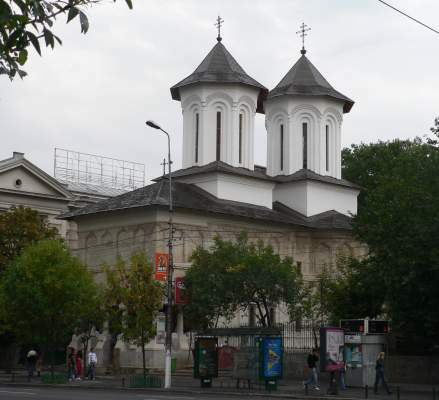 The Colţea church from Bucharest was erected by spatharius Mihail Cantacuzino (1650 - 1716), brother of the Walachian ruler Şerban Cantacuzino, on the place of an older church. Near the church Mihail Cantacuzino - who was educated in an Italian University - constructed a hospital, a pharmacy and a Slavic school. Also near the church was built in 1715 the Colţea tower (demolished in 1888). The church preserved some of the frescoes painted (probably) by Pîrvu Mutu, partially covered at 1871 by new paintings of Gheorghe Tattarescu (he also painted the Metropolitan church from Iaşi). The steeple - belfry above the narthex (the steeple represented on the coin) was reconstructed between 1950 and 1955. The great earthquake from 1977 damaged seriously the church. The restoration of the Colţea church during the last years comprised the rebuilding of the second steeple, the one above the nave (collapsed after the earthquake of 1940 and after the WW2 bombardments over Bucharest). Today the church is very close to its original mien. So, nowadays the church looks differently from 2002, when the coin was minted.